All I knew was I needed a project to keep me busy during the winter. Other than that I was clueless, though to be fair I did own a couple of guitars and I enjoyed playing them – or at least pretending like I was – so I knew a bit about how a guitar felt, how they sounded both by strumming and when drumming on the body and I knew if I did build one what I wanted it to look like: a steel string dreadnought style guitar. Looking back I see that having that knowledge and familiarity was actually quite helpful. Even so I still had some looming questions like what kind of tools I would need, what kind of materials I should use, how I was going to get those materials, how I was going to come up with a workable design, how much it would cost and so on and so forth. So I googled it. The first search result and I was hooked, a blog titled Building an Acoustic Guitar in your Kitchen by Steve Summerford. The guitar that Mr. Summerford had built looked absolutely incredible, and he built it in his kitchen… suddenly building a guitar seemed a much more realistic prospect. Upon finishing Mr. Summerford’s blog I decided to take his advice and purchase a copy of the book Guitarmaking written by Jonathan D. Natelson and William R. Cumpiano. It didn’t disappoint, I found it to be an indispensable resource on practically everything I needed to know about how to build a guitar, including tool recommendations, design guidelines, helpful techniques, technical explanations and relevant historical background. By far and away it was my most important resource, I followed the construction process outlined in the book nearly to the letter with one major exception: I used a dovetail neck joint rather than a mortised neck joint. I can’t say exactly why I decided to use a dovetail joint for my guitar other than it just appealed to me. Another resource that I relied heavily upon, especially for guidance on making the dovetail joint was the web site titled Building an Acoustic Steel-String Guitar created by Jonathan Sevy. It’s got some great pictures and tips. I spent a lot of time poring over this site. There is a lot more information available through the internet, YouTube videos and how to articles and there are a lot other books available too, but for the most part I only used the two main resources discussed above. Finally I found having a real life guitar to look at and study was very helpful to get a good feel when choosing the various dimensions of the guitar during the design phase (neck width and taper, body size and shape, fretboard curvature, scale length and so on). The shape of the body was the first step I took in the design of the guitar. Following the advice of Natelson and Cumpiano I chose to make a fairly normal sized guitar body, approximately 20 inches long by 16 inches wide. 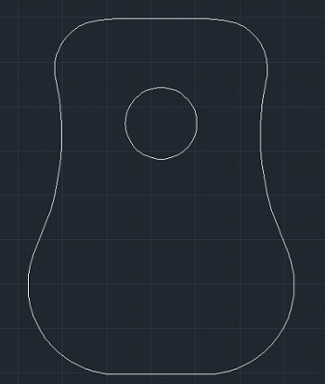 I used AutoCAD (I had a free student version) to refine the curves until I was happy with the result as shown below. 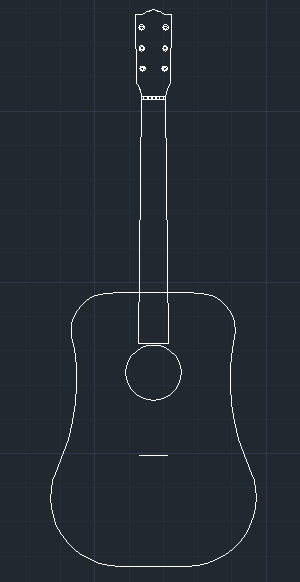 I will say if I had to do this all over again I would most certainly do the design again in a computer drafting program of some sort, it just made it really easy to get measurements on any part of the guitar that I wanted. To continue the design process I chose a scale length of 25.4 inches to match the guitar built by Natelson and Cumpiano and I also chose to have 21 frets and to align the 14th fret with the top of the body like they did, which seems to be pretty common configuration. At first I wasn’t really comfortable with the placement of the neck/fretboard and the body, I was afraid of messing up the scale and tune-ability of my guitar by not having everything perfectly placed and I didn’t completely understand how it all worked (I do not mean to say that I was confused by Natelson’s and Cumpiano’s explanation of the guitar’s layout, it was actually quite easy to follow, I just didn’t fully understand how they arrived at the dimensions that they did). 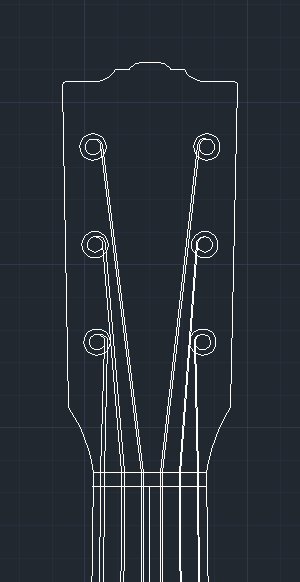 However, it occurred to me later on that all you really need to do is pick a scale length and then decide which fret you want to align with the top of the body at the neck joint. Once you’ve made those decisions you can simply base the rest of your design off of those constraints. You can determine how long your neck must be by simply calculating the distance from the nut (the top of the scale length) to the fret you chose to align to the top of the body and you can determine the position of the sound hole by deciding how many frets you want on your guitar and then by calculating the distance from the top of the body to the end of the fret board. The picture below hopefully helps to explain it better. So how are those calculations performed? I found that there are lots of fret calculators available online as well as pre-made fret spacing tables, but if you’re like me you want to know how to do it from scratch. At any rate the drawings below show what I eventually came up with for my core design, all thanks to the guidance of Natelson and Cumpiano’s book. With the essential design completed the next step was to obtain the actual materials and figure out the tools I needed to get started. For the most part I got my materials from Stewart-MacDonald. I was pretty happy with them, they had pretty much everything I needed to build a guitar (although seems like their wood selection is limited, so if you’re looking for some particular exotic woods you might be out of luck) and I got my stuff really fast (at least for Alaska). If you’re interested I put my entire bill of materials up in the Cost section. As far as tools go, I immediately bought a hand planer, digital caliper, dovetail saw, coping saw, scraper, precision ruler, engineering square, and a spokeshave. They were all good to have, although I didn’t really need the spokeshave until I got around to carving the neck. Thanks for the info, I updated my link to your site. Hi, I would like to talk to you about a project on the same field. I need to do a project for school on building something and learning a new skill. I would greatly appreciate some tips. thank you!